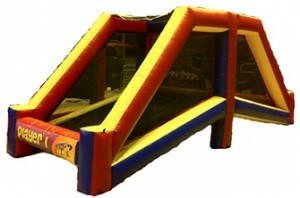 Another new bounce game from Shaughnessy Rental! Test your football throwing skills against your friends! This game features a double-sided target area that connects in the middle. The more footballs you throw through the target, the more balls your opponent ends up with! First person with no footballs left wins!